While technology convergence translates into new revenue-generating opportunities for service providers and new functionality for consumers, it means additional complexity for network equipment manufacturers who already face staggering shifts in the marketplace: fixed-mobile convergence, IP multimedia subsystem, and 4G - to name but a few. 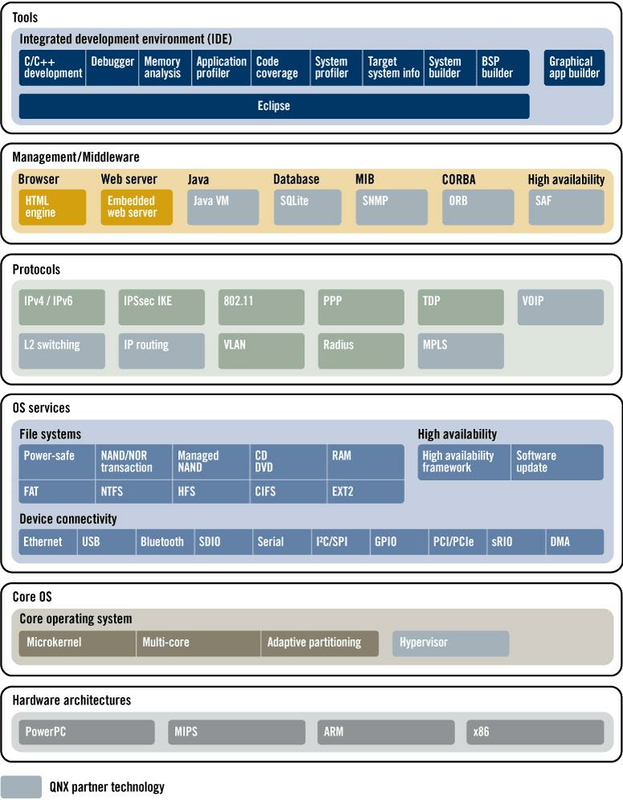 Developing networking equipment is the single most complex task in the embedded market. Networking designs push the absolute limit of performance, reliability, and scalability. QNX Software Systems provides the most reliable and scalable RTOS, industry leading multi-core processor support, high availability framework, and a comprehensive Eclipse-based tool chain to ensure that your next design is successful. The QNX networking software stack provides a complete solution for customers developing networking and telecoms equipment. Based on the ultra-reliable QNX Neutrino RTOS, it offers broad protocol support and middleware, and supports all key networking silicon architectures. What's more, the QNX networking software stack readily scales from a SOHO gateway to a distributed multi-chassis system with hundreds of nodes. The QNX networking software architecture stack provides a reusable base that can be used in a variety of applications. Built from the ground up to support multi-processing, the award-winning QNX Momentics Tool Suite is the industry's most advanced IDE for real-time development. It offers the full spectrum of tools for developing, debugging, and optimizing code, and is equally at home in uni-core and multi-core environments. Provided by QNX Software Systems and a growing ecosystem, this layer provides key services including SNMP, service availability forum HA, Corba, and web services. QNX Software Systems provides a number of natively supported networking protocols based on standard industry implementations. Stacks are pre-integrated and fully tested with the QNX Neutrino RTOS for reduced development time and accelerated product delivery. In addition, many third party protocol vendors also provide pre-integrated offerings including VOIP, IP routing, and more. QNX Software Systems supports a wide range of block and flash file system formats. Networking developers value the reliability and security of our power-safe disk file system for guaranteed data integrity even in the most demanding environments. Our NOR and NAND flash file systems provide enhanced features such as a standard POSIX interface, fault tolerance to power failures, and wear levelling for extended part lifetime. No market imposes more stringent requirements for availability than networking and no RTOS offers more in terms of reliability than the QNX Neutrino RTOS. To further increase availability, QNX Software Systems offers a high availability framework. Using this framework, developers can devise fault recovery scenarios that can execute without a system reboot. The QNX Neutrino RTOS is designed specifically to meet the most demanding reliability and performance requirements. The microkernel architecture incorporates only core functionality into a tiny, well-tested kernel while leaving drivers, networking stacks, and other services outside in memory protected space. This creates the ideal foundation for 99.999% reliability. Driven by the need for maximum processing power in high-end networking equipment, QNX Software Systems has supported discrete implementations of multi-processing for over a decade. QNX multi-core technology ships today in many production programs and has been hardened by use in the most demanding applications. Likewise the QNX Momentics Tool Suite was developed from the ground up with multi-processing in mind; it is the most sophisticated multi-core development environment available today. QNX Software Systems provides a comprehensive suite of natively supported networking protocols based on standard industry implementations. Stacks are pre-integrated and fully tested with the QNX Neutrino RTOS, allowing developers to reduce development time and accelerate product delivery. With the QNX Neutrino RTOS, networking protocols execute outside the kernel as separate, memory-protected processes. As a result, developers can combine any number of natively supported networking protocols, including TCP/IP and transparent distributed processing. They can also run multiple applications, such as virtual routing, using a single protocol stack on a single physical box to add incremental security or management for specific applications. End-user demands continue to drive the need for maximum processing power. Silicon vendors, unable to scale exclusively with clock speed, have moved to a multi-core architecture to increase overall performance. While this solves the overall MIPs problem, it introduces a new level of complexity for the networking software developer. QNX Software Systems is the only RTOS vendor to provide a comprehensive multi-core offering. In fact, we've supported discrete implementations of multi-processing for over a decade. Our multi-core technology ships today in many production programs and has been hardened by use in the most demanding applications. Developers can choose to let some processes run in SMP mode while using BMP to migrate legacy code. QNX Software Systems understands that tools play a critical role in debugging and optimizing complex networking applications. That's why the QNX Momentics Tool Suite was built from the ground up to support multi-processing. It is, in fact, the only fully multi-core-aware tool suite available today. It offers highly advanced visualization tools such as application and system profilers, which allow developers to indentify code that can benefit from multi-core processing and to get a thread-level view of system performance. Networking developers want the self sufficiency and code access that comes with an open source model but also understand the benefits of a commercially supported offering - quality product management, published roadmaps, IP protection, and professional support. QNX Professional Services is a committed group of engineers with extensive experience optimizing systems for the brave new-world of multi-core processing, migrating code from Linux platforms, and supporting custom networking boards. We understand the importance of avoiding product downtime, keeping up with the latest hardware advancements, and leveraging investments in core IP - and we take great pride in sharing our expertise. Along with our extensive support and professional services offering, we help our networking customers in the following ways. Parallelism is an important design consideration for the networking industry whose performance-hungry, compute-intensive applications require parallel software that uses multiple cores simultaneously. QNX Software Systems has been supporting symmetric multi-processing (SMP) since 1997. Our professional services practice of developers, engineers, and architects can help dramatically improve system performance using multi-core optimization techniques and visualization tools. Network equipment manufacturers are increasingly interested in the benefits of real-time computing for achieving 99.999% reliability. Customers porting Linux applications to the QNX Neutrino RTOS find it surprisingly straightforward (since both use the POSIX API), however, they also find porting low-level Linux drivers (to any OS) to be a bit more challenging. QNX Professional Services can keep you on a smooth migration path while ensuring your ported applications are fast, reliable, and maintainable. Our software engineers are seasoned experts in developing optimized QNX-compatible drivers and board support packages (BSPs) for networking-centric platforms. We use our extensive experience with leading-edge networking hardware (like the Freescale QorIQ platform and Cavium Networks OCTEON family) to ensure software integration is optimal and maintainable for current and future deployments. When Adtran went looking for a successor to their in-house OS, they selected the QNX Neutrino RTOS for its highly available architecture, comprehensive development suite and the ability to scale across their entire product line. Tired of complex debugging in the VxWorks environment, Ciena switched to the QNX Neutrino RTOS for their CN 1000 Broadband Loop Carrier Next Generation Access Platform. QNX architecture enabled developers at Ciena to rapidly isolate issues and greatly accelerate the debugging of their systems. When Cisco wanted to start developing their next generation software platform, they turned to QNX Software Systems. Today the QNX Neutrino RTOS is at the heart of Cisco's Modular IOS and IOS-XR software, and powers many Cisco products including the Cisco CRS-1, the world's highest capacity router. Absolute reliability and world class support drove DragonWave to choose QNX technology for the Horizon Duo, their next generation carrier-grade microwave product. When Infinera was architecting the Infinera DTN, the world's first switched WDM digital ROADM system, they quickly realized that their design would need a highly scalable architecture. They chose the QNX Neutrino RTOS for its ability to support and debug a design with upwards of 1000 threads. The JDSU WaveReady product line is a scalable Wavelength Division Multiplexing (WDM) optical transport solution designed for metro, access, and enterprise optical networks. JDSU selected the QNX Neutrino RTOS for its high availability and reliability, key attributes of the market JDSU serves. BTI Photonics needed to jump start their development in advance of hardware availability. They selected the QNX Neutrino RTOS over Linux for their BTI 7000 optical repeaters for its high availability and ability to prototype on desktop machines. In addition, the modular nature of the QNX architecture enabled them to dramatically decrease their time to market. When selecting an OS for the SSX-3000 mobile broadband access gateway, Stoke wanted clean IP and access to kernel source. Linux and the GNU Public License were not an option; the QNX hybrid software model fit the bill.